1 pint grape-sized tomatoes or cherry tomatoes. Remove the tough outer skin off the asparagus stalks using a vegetable peeler. Cut the stalks into pieces about 1 ½ inches in length. Cut the grape-sized tomatoes in half horizontally, or if using cherry tomatoes, cut them into quarters. Pour ¼ cup of olive oil into a large skillet. Heat the oil over high heat, add the asparagus stalk pieces and sauté until crisp and al dente. Add the asparagus tips and stir briefly. Remove from the heat and set aside. Fill the serving dish with hot water to heat it. Once heated, drain and dry the dish. In the meantime, bring 4 quarts of water to a rolling boil in a large stockpot. Add the salt and then the penne. Stir to prevent the pasta from sticking together. Allow the pasta to boil until cooked al dente, according to package directions, about 10 minutes. Remove the stockpot from the heat and pour the pasta and water into a colander that has been placed in the sink. Once drained, shake the colander and then pour the pasta into the heated serving bowl. 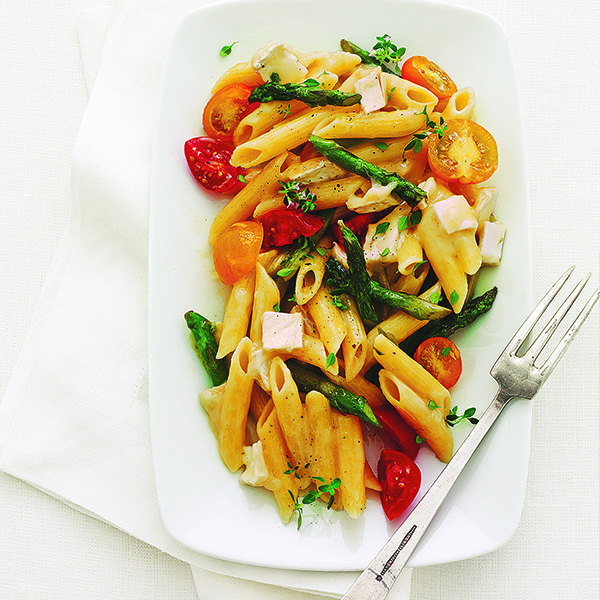 Drizzle the remaining ¼ cup of olive oil over the pasta, add the sautéed asparagus with its oil and the raw tomatoes, and toss well. Season to taste with salt and pepper. Add the Brie and toss to distribute the cheese throughout the pasta. Be careful to keep the Brie pieces separated so that they do not clump together. The heat of the pasta will melt the cheese as it is distributed throughout the cheese. To serve, sprinkle the thyme over the pasta and serve immediately.